Formerly known simply as the Johnny Young Band and releasing two albums under that moniker, Brooklyn-based Bloodroot has delivered a self-titled MCD of commercially viable, groove-laden hard rock. Garnering significant exposure through extensive touring and rotation on cable music channels, the band is posturing themselves for a mainstream breakout. 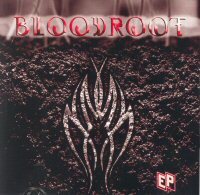 Bloodroot the album is a blend of Stone Temple Pilots, Soundgarden, and Creed held together by mainman Johnny Young's powerful voice and excellent guitar skills. Normally operating in a lower range akin to Scott Weiland or Layne Staley, Johnny sounds remarkably like Colin Hay of Men At Work on the first track "Strength". An interesting sound for this type of music, but as both bands produce catchy melodies it works pretty well. Having learned the rock ropes under the tutelage of guitarist Mick Taylor (Rolling Stones), Johnny's six-string skills are evident throughout the album expressed in the form of tricky leads, groovy riffs, and first-rate solos. The bass of Jairo Ruiz is distinct and up in the mix, giving the music a dose of modern heaviness. Karl Wilcox, former drummer of NWOBHM legends Diamond Head, is flawless behind the kit. The standout track on Bloodroot is "Earth Below", featuring the use of a tablas to complement the overall Eastern vibe of the music. Johnny belts out a solo that, while not blistering, is one of his most expressive of the album. Bloodroot is a band awash in talent. They possess the ingredients necessary for success, so it's just a matter of time before they're picked up. Modern rock fans are advised to give these guys a listen.